Baby E lines up his Hot Wheels cars on the fireplace, each one meticulously after the other in a perfectly straight line. Baby E says, “Cars,” again with a smile and turns back to playing. “He doesn’t know who Joey is,” my seven year old states matter of factly. Please continue reading this post on Her View from Home . 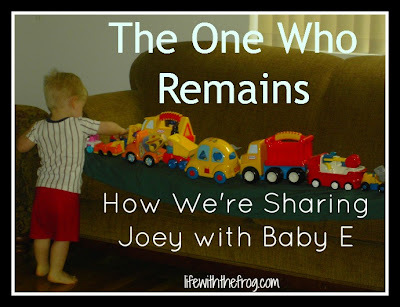 . .
And then please come back to read how my friend and blog sponsor, Jessica, from Four Plus an Angel handles talking to her children about their sister, taken too soon as well.